It seems like every time you visit the eye doctor there are new posters and brochures placed throughout the office letting you know about a new contact lens the practice now offers. Typically, these ads are for soft “off-the-shelf” lens designs, meaning they’re made to fit a majority of patients. Although some of these are highly advanced designs with special features—such as built-in multifocals and prescriptions for astigmatism—they aren’t really customized per se. Make no mistake, all contact lenses are medical devices, but selecting a pair off the shelf is a little bit like buying pants off the rack. The end result probably won’t be quite the same as if a tailor fit a pair specifically for you. There is a common misconception that specialty contact lenses aren’t necessary for eyes with standard prescriptions. But this is sort of like saying you don’t need to go to a tailor unless you’re really tall. If you’re not satisfied with the vision provided by the contact lenses you are currently wearing, it may be worth trying something else. Fortunately, there are more options than ever before. Here are three out-of-the-ordinary contact lens designs to consider in 2017. Categorically speaking, “hard lenses,” have been around for a really long time, so you might not assume they’re cutting edge. But these lenses, which are officially known as gas permeables (GP), have evolved dramatically, while still maintaining their stellar reputation for outstanding optics. In fact, in terms of optical quality, GP lenses raise the bar so high that there’s really no contest between these lenses and most soft designs. With respect to comfort, rest assured that changes in material and design characteristics have made modern GP lenses almost unrecognizable in comparison to the old-fashioned contacts that were worn back in the 1970’s. Modern GPs also allow oxygen to pass through the lens and reach your eye. Best of all, sophisticated technology will allow your doctor to take precise measurements so that a GP lens can be custom-made just for you. The SynergEyes GP II lens was introduced into the United States in 2017. The lens provides excellent, stable vision and is ideal if you are seeking greater comfort with gas permeable lenses. The GP II design includes an innovative “tear reservoir” that helps keep eyes moist. Doctors have been prescribing scleral lenses for hard-to-treat eyes for many years and are beginning to discover that these lenses have more benefits and can be worn by more people than they previously offered them to. These advanced technology lenses fall into the GP lens category since they’re made out of similar materials, but the design is highly unique. Sclerals are bigger than most lenses. Instead of covering only part of the cornea, these larger designs vault over the entire corneal surface and rest on the sclera (the white part of your eye). Whether your eyes have an irregular shape that require a specialty lens or just feel dry when you wear regular soft lenses, sclerals may help. In fact, the vaulting design of scleral lenses allows a protective fluid reservoir to form underneath the back surface of the lens, which also helps keep eyes moist and comfortable. Since doctors are finding more and more excellent uses for sclerals, the lenses are somewhat in vogue right now. But ironically, scleral lenses were the first contact lenses described in medical literature in the late 1800s. Of course, these rudimentary lenses were nothing like the ones we use now. The SynergEyes VS scleral was very recently introduced in the United States. It was designed by the leading European authority on contact lenses and has extraordinary levels of oxygen permeability for optimum ocular health. A third exciting kind of lens worth considering in 2017 is called a hybrid. Because part of a hybrid lens is hard while the other is soft, many people say these lenses offer the best of both worlds. The center of the lens, which is the part that’s used for optical quality, is made of a GP material. The outside “lens skirt,” is made of a soft material to promote comfort and ease-of-wear. As an added bonus, the soft lens skirt also helps prevent dirt and debris from getting under the lens. The SynergEyes Duette hybrid lens is custom-made for all types of people. Whether you have astigmatism, presbyopia, neither or both, Duette delivers great vision and comfort. The SynergEyes UltraHealth hybrid lens is for patients with keratoconus. 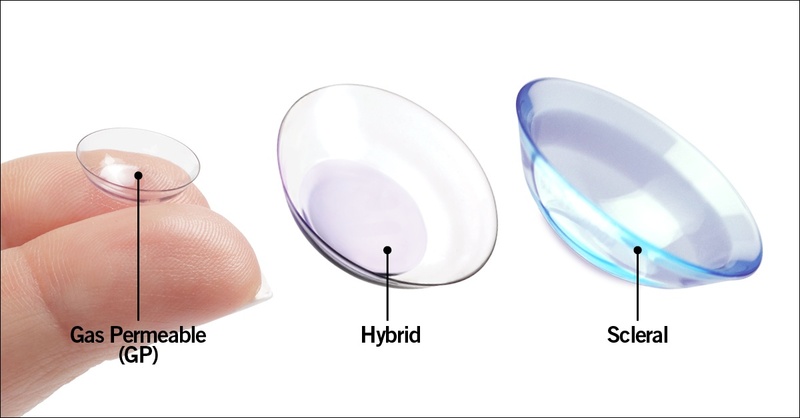 2017 saw the introduction of a new lens coating on Duette and UltraHealth hybrid lenses, called Tangible Hydra-PEG. This innovation was designed by Tangible Science to enhance moisture and comfort in contact lenses. If you’re not 100% satisfied with your current contacts, resolve to ask your doctor if any of these new lens innovations are right for you. Even if none of these choices are suitable for you, your doctor may be able to help in other ways. It all begins with you, so speak up and make 2017 the year you get happy and comfortable in your contact lenses. Scleral Lens Education Society. Available at: https://www.sclerallens.org/understanding-scleral-lenses.